Johnny Long's last book sold 12,000 units worldwide. Kevin Mitnick's last book sold 40,000 units in North America. As the cliché goes, information is power. In this age of technology, an increasing majority of the world's information is stored electronically. It makes sense then that we rely on high-tech electronic protection systems to guard that information. As professional hackers, Johnny Long and Kevin Mitnick get paid to uncover weaknesses in those systems and exploit them. Whether breaking into buildings or slipping past industrial-grade firewalls, their goal has always been the same: extract the information using any means necessary. After hundreds of jobs, they have discovered the secrets to bypassing every conceivable high-tech security system. This book reveals those secrets; as the title suggests, it has nothing to do with high technology. • Dumpster Diving Be a good sport and don’t read the two “D” words written in big bold letters above, and act surprised when I tell you hackers can accomplish this without relying on a single bit of technology (punny). • Tailgating Hackers and ninja both like wearing black, and they do share the ability to slip inside a building and blend with the shadows. • Shoulder Surfing If you like having a screen on your laptop so you can see what you’re working on, don’t read this chapter. • Physical Security Locks are serious business and lock technicians are true engineers, most backed with years of hands-on experience. But what happens when you take the age-old respected profession of the locksmith and sprinkle it with hacker ingenuity? • Social Engineering with Jack Wiles Jack has trained hundreds of federal agents, corporate attorneys, CEOs and internal auditors on computer crime and security-related topics. His unforgettable presentations are filled with three decades of personal "war stories" from the trenches of Information Security and Physical Security. • Google Hacking A hacker doesn’t even need his own computer to do the necessary research. If he can make it to a public library, Kinko's or Internet cafe, he can use Google to process all that data into something useful. • P2P Hacking Let’s assume a guy has no budget, no commercial hacking software, no support from organized crime and no fancy gear. With all those restrictions, is this guy still a threat to you? Have a look at this chapter and judge for yourself. • People Watching Skilled people watchers can learn a whole lot in just a few quick glances. In this chapter we’ll take a look at a few examples of the types of things that draws a no-tech hacker’s eye. • Kiosks What happens when a kiosk is more than a kiosk? What happens when the kiosk holds airline passenger information? What if the kiosk holds confidential patient information? What if the kiosk holds cash? • Vehicle Surveillance Most people don’t realize that some of the most thrilling vehicular espionage happens when the cars aren't moving at all! Security specialists in the physical and IT security fields will find this invaluable. Full of real-world examples, it is suitable as a training manual for new employee awareness. Kevin Mitnick (Technical Editor) is the most famous computer hacker in the world. Since his first arrest in 1981, at age 17, he has spent nearly half his adult life either in prison or as a fugitive. He has been the subject of three books and his alleged 1982 hack into NORAD inspired the movie War Games. Since his plea-bargain release in 2000, he says he has reformed and is devoting his talents to helping computer security. 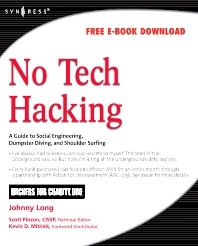 Technical Editor, Hacker, best-selling author of The Art of Deception, U.S.A.
Johnny Long is a Christian by grace, a professional hacker by trade, a pirate by blood, a ninja in training, a security researcher and author. He can be found lurking at his website (http://johnny.ihackstuff.com). He is the founder of Hackers For Charity(http://ihackcharities.org), an organization that provides hackers with job experience while leveraging their skills for charities that need those skills.